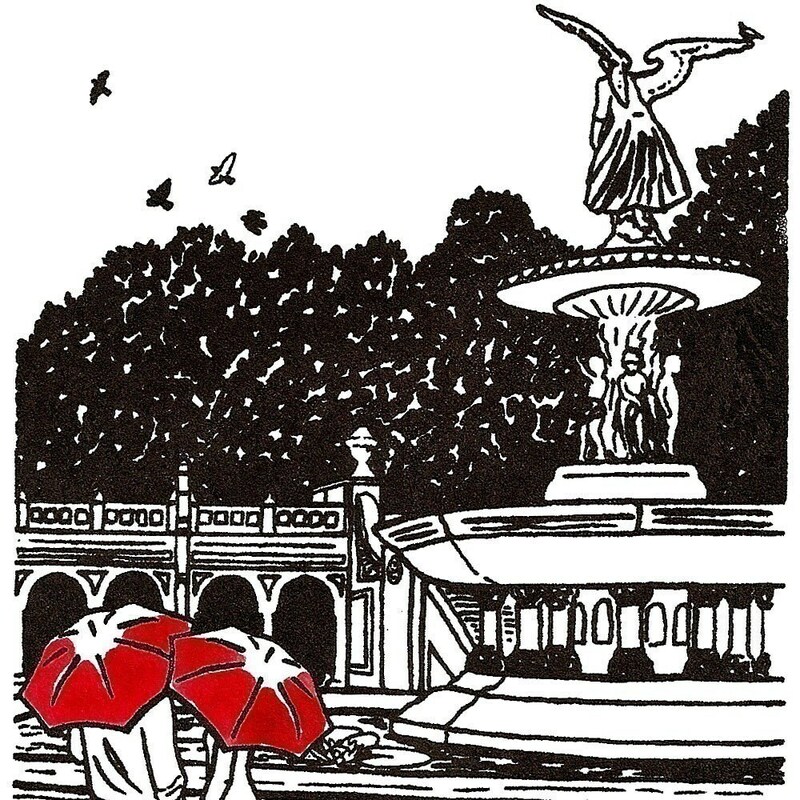 This original gocco screenprint shows a couple enjoying Bethesda Terrace in Central Park on a rainy spring afternoon. This print is part of a limited edition of 250. The black is hand printed from an original illustration, and the red umbrellas are painted with watercolor (please allow for some minor variations since each one is individually printed and painted). The image size is approximately 3.5 x 5.75 inches on white Stonehenge paper. The total paper size is approximately 9 x 6 inches. I know the paper size is unusual, but never fear, you don't need a custom framing job, an 8x10 inch frame with a standard white 5x7 mat looks great! I usually buy mine from Michael's craft stores, where they sell simple black frames with the mat already included (these are the frames my prints are pictured in). Each print is signed and numbered. Edition number subject to availability. The print will be shipped in a protective cello sleeve and a stay-flat cardboard envelope. ***The watermarking that is on the scan of the print is not on the actual print! The actual print appears as in the photos. Virginia Tech 5x7 print- Pick your couple and umbrella color! Gave this to a Hokie couple as a gift and brought them to tears! The frame suggestions on the website worked perfectly, too. Love it! This is my second print from this shop and it's just as beautiful. DC Love- Jefferson 8x10 print- Pick your couple and umbrella color! All Virginia residents will be charged a 5% state sales tax. I accept credit cards, Paypal and Etsy gift cards. I'm happy to cancel (or modify) an order if for some reason you decide you don't want it, as long as I have not shipped it yet. Please contact me if you don't love your purchase, if you don't receive it in a reasonable amount of time, or if it has been damaged in shipping. I can give refunds or exchanges if you don't love the print, less the shipping cost. However, I only accept returns/exchanges that are in the original packaging (plastic bag and rigid stay-flat mailer). I can't be held responsible if I send a print to an incorrect address you've given me (although if it is returned to me I will resend it if you pay shipping again), but if it is my mistake or that of the post office I'll do my best to make it right. I ship within 1-3 days of purchase. FOR FASTER SHIPPING: You can choose Priority shipping on items in your cart, which will get your order to you 1-3 business days after I ship it (I also try whenever possible to ship within 24 hours after you order). All orders are shipped in a cellophane bag and stay-flat envelope. INTERNATIONAL: I ship using USPS first class international. It can take up to a few weeks to arrive. I am not responsible for any customs fees. The price of my prints typically fall below the threshold for paying customs fees for most countries, but since I can't keep up with the regulations for every country, please see what the limit is for your country before you buy. I apologize for the exorbitant shipping costs, but USPS recently raised the prices to ship internationally by quite a lot. If for some reason it works out that shipping to you ends up being less than you were charged, I will refund the difference. GIFTS: If you are buying a gift, tick the "gift" box at checkout and I'll leave out price info and my business card. I'm happy to include a message to the recipient as well, just let me know what you'd like it to say in the notes box at checkout. Please note that copyright is not transferable with your purchase and no reproductions can be made without my prior written permission. If you post photos of my work online, please credit me either by name (Megan Nolton) or business name (Art Shark Designs). I'd also appreciate a link to this shop! Chicago Love 5x7 print- Pick your couple and umbrella color! Alexandria Love 5x7 print- Pick your couple and umbrella color! Rome Love 8x10 print- Pick your couple and umbrella color!